Previous PostSaving Money and Weekly Update–January 15, 2018Next PostWhat Did We Eat–Winter Garden Goodies! January 20, 2018. Love the greenhouse. Some how I was imaging something it a lot smaller too. Way to go Rob! I’ve been making plans for my garden spaces as well. I had hoped to go to the garden store today for their member’s sale but didn’t have the energy for it. So for now, it’s just me making notes in a notebook and going through my seed catalog. I use West Coast seeds which at one time was ‘related’ to Territorial Seeds.It’s a local BC company and the seeds have done well for me in the past. So,are you planning to do add in any soil this year? Other amendments? Do you compost? Just curious. I do compost. Right now, we have an ugly pile of all the scraps, clippings, etc. rotting away on the edge of the garden. Eventually, Rob will build me a nice 3-bin composting set-up like I had at the last house. Last time, he used free pallets. Hopefully, he can get some this time. So, for now, the plan is to spread that 1/2 finished compost all over the garden, and till it in in the spring. We will also buy some steer manure, I think. We haven’t got that far, yet, but have discussed that we need to amend the soil in some way. 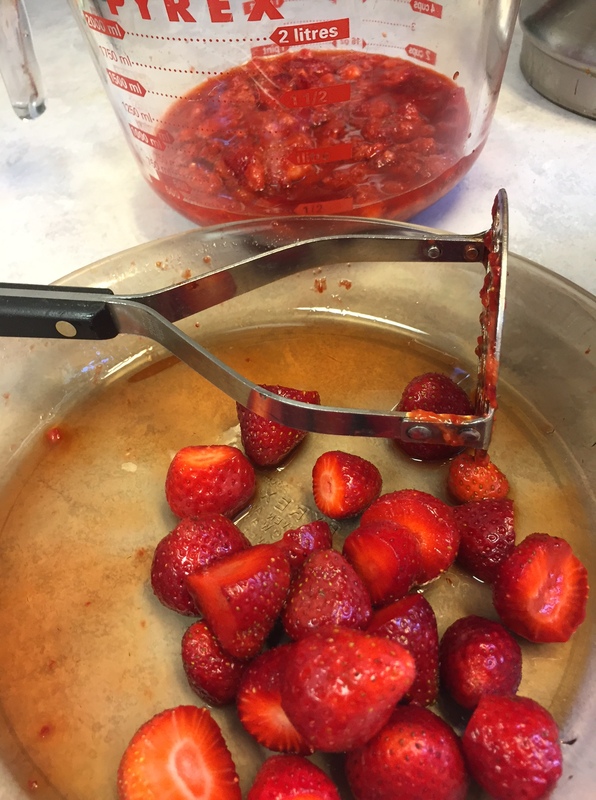 All summer, we dumped the grass clippings around the berries, or poured them in the garden, and had dumped some ashes on the garden as well over the winter. We have a big bag of organic fertilizer we can use, and I ordered a small container of some tomato fertilizer I’ve never tried before, that says it addresses the blossom end rot. We shall see, but worth a try. It wasn’t bad last summer, but with such a small garden, I don’t want to wear out the soil. I have some bone meal for the strawberries. That’s a start, anyway. my neighbor loves to work in her yard too. That was awesome that you could find someone who would appreciate them as much as you do! Do you have any place to garden at this new place? Isn’t pouring through the seed catalogues fun? 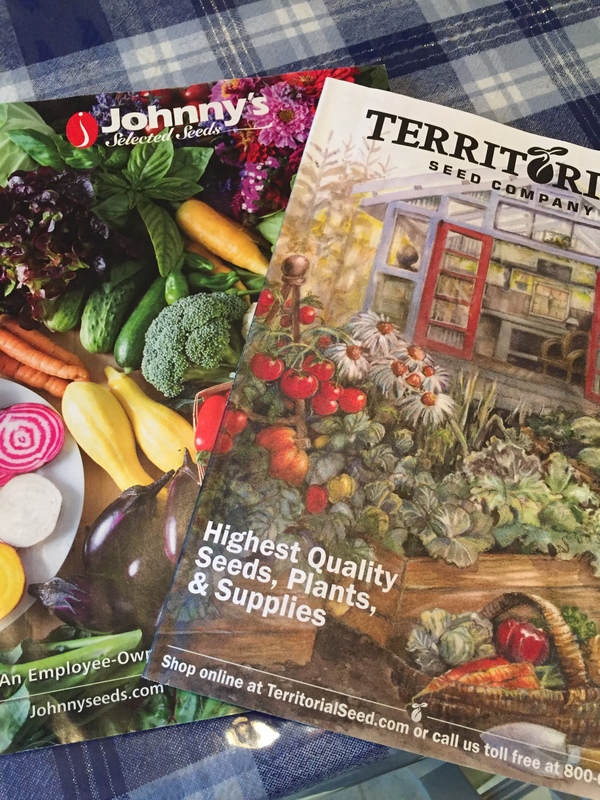 🙂 I have the Territorial Seeds catalogue also and they have my ground cherry seeds in it. I was so happy to see that. I’ll order the smallest amount of seed they have and see how they do. You talk of dumping the ashes in the garden reminded me that I need to ask Jeff where he is dumping the ashes from the pellet stove. I hope he remembered to dump them around the rose bushes. My roses thrive when I do that and also put all the banana peels around them. 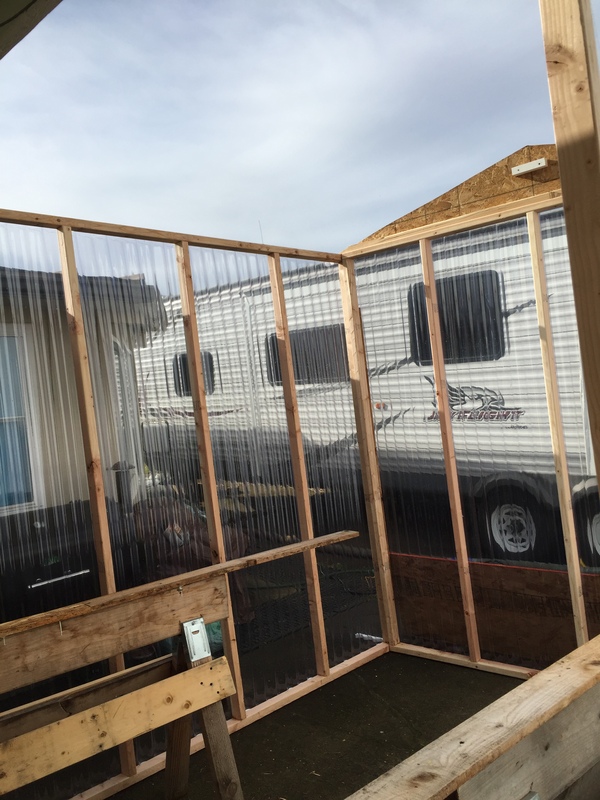 Rob is making the greenhouse in a way that he can unscrew it and we can lean the pieces up against the shop if we decide to take it down. We have very little room if we leave it where it is. That is one reason that it is taking so long to build. Another idea we have discussed it to put it over on the lawn on the side of the house. BUT, it will be super handy on the concrete, so for now, that’s where it will live, at least for a few months. I have piles of ashes around all my roses, too. The roses here are pretty sad. Anything that could help has been added. We will see what another summer brings. We have been measuring to see what size raised bed we can put next to our house. We have all sorts of HOA rules, and we want to make sure we honor those in the process. I’ve never ordered seeds from a catalog. Where I had lived before there was a local hardware store that always set out a pretty impressive variety around planting time, and I just shopped there. I have not done one thing in preparation for the garden. We still have snow on the ground and I have not been able to get in the mood. Spring seems far, far away. I think one thing that is putting me in the mood is the unusual spring-like weather here. After last winter with snow, snow, and more snow, we are super mild this year. I guess that’s how we get averages. I think the break I had from starting my own seeds put me in the mood, as well, to do it again! Poring over seed catalogs can be a fun activity! I haven’t really thought much about planting a garden, although I guess I should. 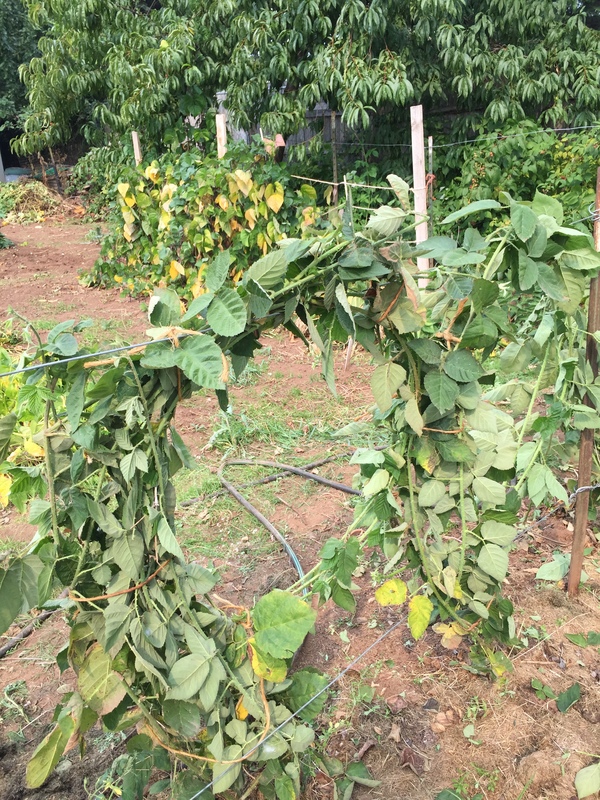 Last year’s garden withered up when the temperatures soared to above 100F as the seedlings started growing! I did have my gardener friend plant two grape vines for me – we’ll see how that comes up. I am just super excited about gardening this year! It’s also a big project to get that greenhouse done, and the plants started, and I don’t want to miss the window of opportunity to get those peppers started–they take SO long, and I missed my favorites last year. The ones I bought just weren’t the same, especially the jalapeños. The ones I grew last year had no flavor at all. Just blah….So, I ordered some with a bit more spice to them! We love jalapeño poppers on occasion, but I like a little flavor to them. I also use them for my salsa, which I can.